There is something almost magical and torturous about aging. It's the beauty of life versus our inevitable death. The emphatic sense of wonder and of loss. The tantalizing image of "like sands through an hourglass, these are the days of our lives," an evocative hint of our own deprivation. The older I get, the more I ponder about death. And while I do not mind getting older, I want to slow down the aging process. It is daunting to notice forehead furrows, laugh lines, creases and frown lines becoming more prominent. I would love to remain youthful and young at heart. I have these visions of my older self. I'm on a bike with a frontal basket, with a baguette in some little European village riding round in my 50s. The other, my friend Lisa and I are two old women in our 80s, in rocking chairs, laughing, each batting a good grog, recounting our stories of yesteryear. I have a glass in one hand filled with a white liquor (thinking I've finally made it over to the dark side, it's vodka). I once had the delight of a cigarette in my left hand (but since I no longer smoke, my thoughts have not filled that now empty hand but then again, maybe I could still hold onto it and use the Bill Clinton marijuana excuse quote, "I experimented ... I didn't inhale and never tried it again.") My bright red lipstick is smudged, extended way beyond the outer corner of my lip on one side. I'm assuming way too shaky by then to apply it within my lip line, yet too unconcerned to even care. LOL. While writing this two things come to mind; Facebook recently changed access to profiles of deceased and the movie 'Amour' about Georges and Anne, an octogenarian couple until one day, Anne had a stroke, and the couple's bond of love is severely tested. This movie is a profound depiction of the emotional and physical ravages of old age. Ok, let's get over the TORTURE of aging ... Whew. I have such admiration for the mature woman who still dolls up; hair done, lipstick, fine jewelry, even heels or the older gentleman who still dons a suit ... And if he has a hat, he's an instant cutie! Fascinated, I wonder about their life stories. Fabricating my own idea of their life story based on their appearance. I imagine what they may have been like in their younger days. Here's what inspired this post. There is something so beautiful about this pic. Her aged hands (reveal she's old). Stiletto nails. Pink polish (yet youthful). All her rings ... especially her cross ring (still believes in God). Mid way rings (daring). Sparkly / diamond rings (maybe wealthy or just has had great lovers). Gold watch (still aware of time, and that she's living). I would love to sit and hear her life story over some gin or cup of tea. Just seeing this picture I am fascinated! 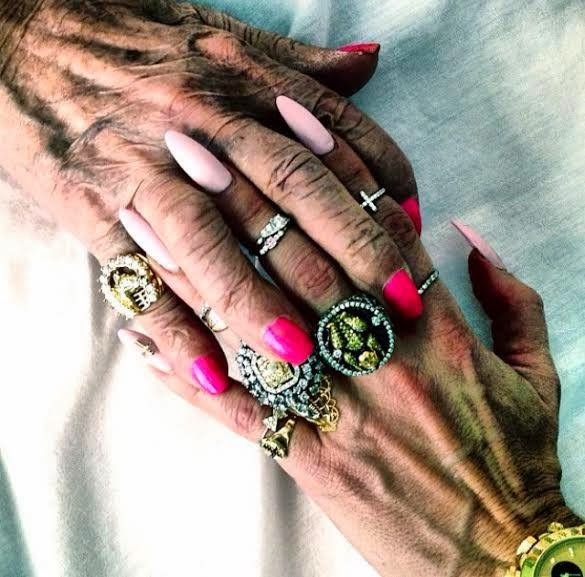 And the more I study this picture, I realize they are the hands of two different aged women. Maybe a mother and daughter! 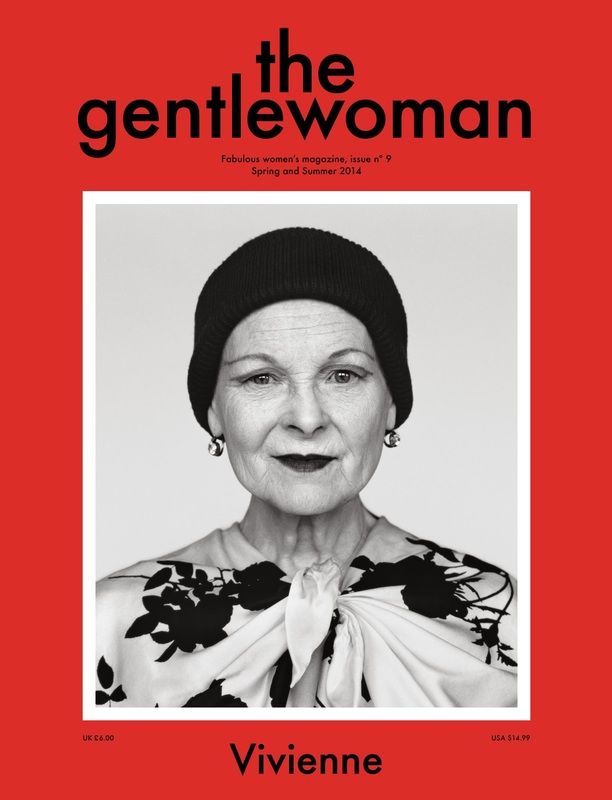 The Gentlewoman magazine: Vivienne Westwood on the cover. Love her style. "It’s Spring/Summer 2014 and change is in the air! For this ninth edition of The Gentlewoman the extraordinary designer Vivienne Westwood leads a cavalcade of audacious and daring women. As one of the pioneering intellectuals of our times, Vivienne has been at the forefront of revolution on more than one occasion. Her visionary ideas for 21st century living are compelling and urgent. Joining Vivienne are 28 exceptional international women of wit, brilliance and beauty: the German architect Annabelle Selldorf; British stylist Camilla Nickerson; the maestra tequilera from Mexico, Bertha González Nieves; Scottish tennis powerhouse Judy Murray; the intriguing Welsh folk singer Cate Le Bon and Italian fashion dynamo Verde Visconti are just some. Rules are dispensed with in our presentation of freewheeling summer fashions, while we also indulge in the pleasures of a solitary drink. Cheers!" ... And got to love Ari Seth Cohen who roams the streets of New York looking for the most stylish and creative older folks. 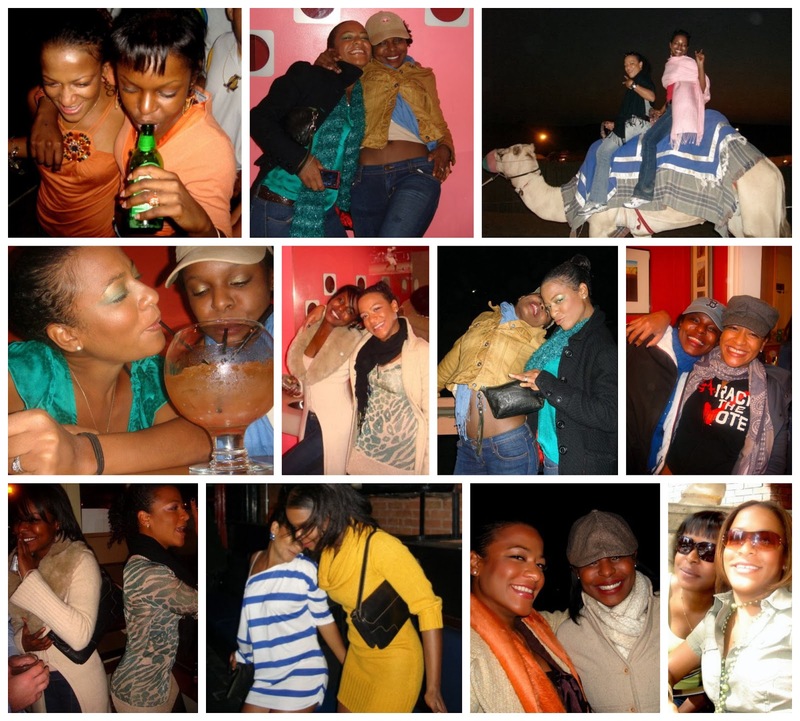 "Respect your elders and let these ladies and gents teach you a thing or two about living life to the fullest. 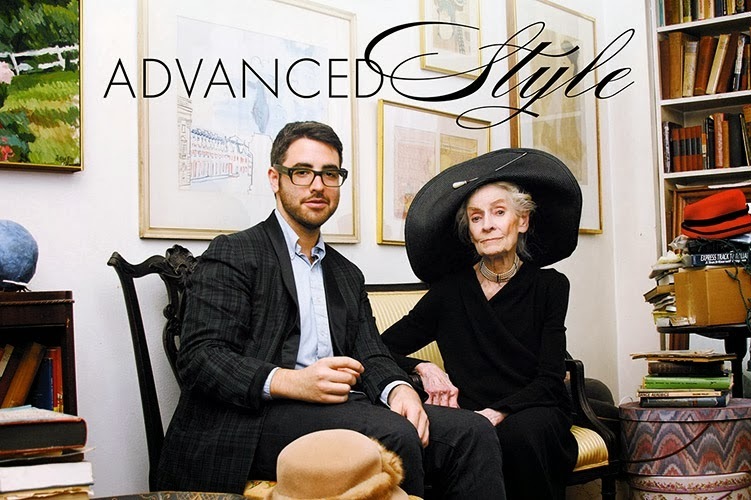 Advanced Style offers proof from the wise and silver-haired set that personal style advances with age."